This is the new light weight rocker guard for the Jeep Wrangler JK. It's sleek design is perfectly contoured to the body and has been trail tested for years! This is a great upgrade for anyone looking for a functional rocker guard with a step on their JK. 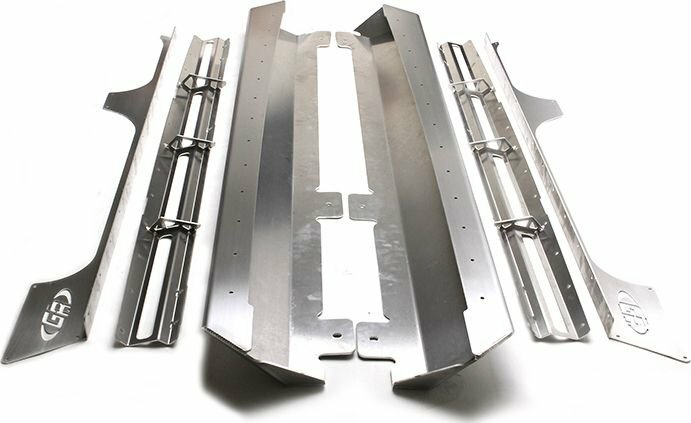 Laser cut and formed from solid 3/16" aluminum alloy plate provides full coverage from front to rear while also protecting the fender flares. Unique 3 piece design is contoured to the body which wraps all the way under to the body mounts for durability. Shipped un-painted and requires paint or powder coat after installation. Although the formed metal steps provide good foot traction in most conditions, the metal tubing can be slippery when wet, therefore we recommend adding grip tape where necessary for better entry and exit foot traction. Will require trimming about 5/8" off the bottom of the factory flares.